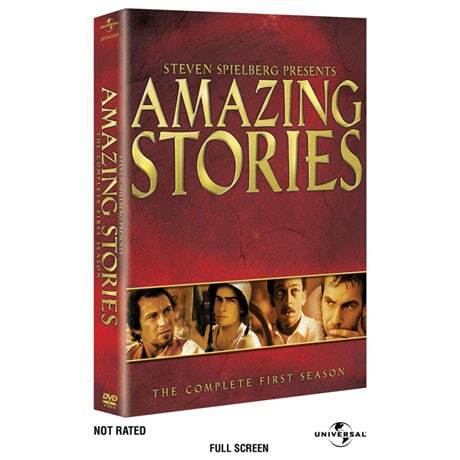 Airing on NBC for just two seasons (1985-87), Spielberg's fantasy and science fiction anthology was nominated for 12 Emmys® and won 5. Spielberg himself directed many episodes, which featured a long list of stars including Kiefer Sutherland, Tim Robbins, John Lithgow, Kevin Costner, Kyra Sedgwick, Patrick Swayze, Sam Waterston, and Mark Hamill. A series with great storytelling and high production values, it was "a creative juggernaut" (Indiewire). Set includes all 5 ¼ hrs, 4 DVDs. All 24 episodes from the first season are included. 20 minutes of deleted footage.